Bob Wheeler had his camera out, too. He sent me these photos this morning. 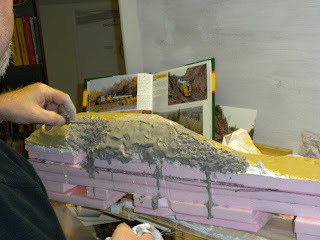 The scenery section reversed and being carved. Scott taking photos of Rick's carving close up. Ken still allergic to plaster. 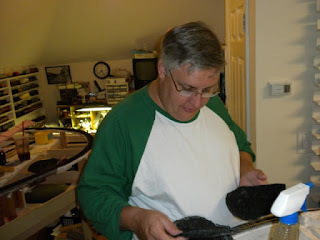 I recently purchased Darryl's latest DVD on model building and about to go downstairs and watch it again. I love it! 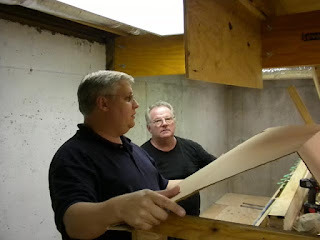 Darryl takes us through the steps to make some simple detail items such as a picnic table, lobster traps, birds nests and store room shelves. But its not the details that are important. Its how he constructs them and the techniques surrounding the assembly. He makes it look so easy. I like his natural approach to keep it simple. Anyone can watch this video and go to the shop and reproduce what he's done. There is way more than $20 worth of information and you don't have to scan over ads like a magazine. It is of great value and I highly recommend it. The filming still leaves a lot to be desired, but it is tough to get close ups of some of this. His wife's hands make a guest appearance and they are much easier on the eyes than Darryl's. But all in all it is a fantastic skill builder! Since I don't sell advertising I can say whatever I want...so this one gets 4 out of 5 stars! You can buy it on Ebay or Dr. Ben's website where I bought my copy. Another great night with the NCI Operating Group! We were at Glue Bob's house having a rock concert! Thanks again to Rick for providing great photos! This makes it much easier on me when I Blog. Thanks! What we really love most about going to Bob's house is that his wife gives us a warm hug and fills our bellies full of goodies, like last night's coconut macaroons! Yummy! 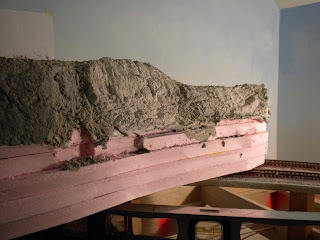 We wanted to work some more on the scenery for Swas Junction, so Scott grabbed the plaster molds and figured out which ones we would use. 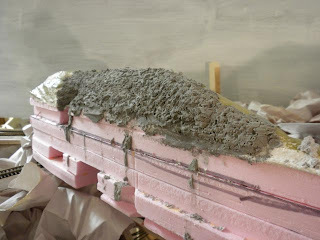 It is very hard to tell on some rock molds which side is up or down, so you have to be careful. If you install it upside down, you'll see it on a photo. 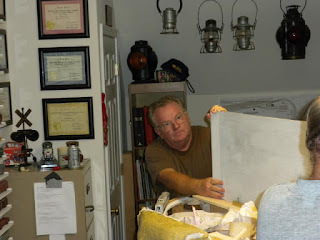 Scott mixed a slurry of Ultracal 30 plaster, one drop of lack Rit liquid dye and water from Bob's hot water heater. 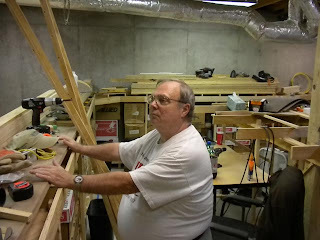 Bob's layout is on the third floor (top) of the house, so we get our exercise running up and down to the garage! 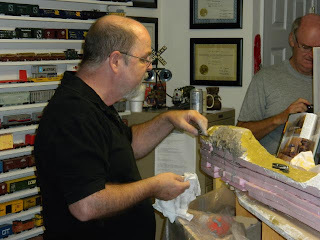 Picking out the mold must be done carefully. Bob had the great idea of going around to all his modeling friends and borrowing their rock molds. This way he had a lot of variety and didn't have to spend a fortune. 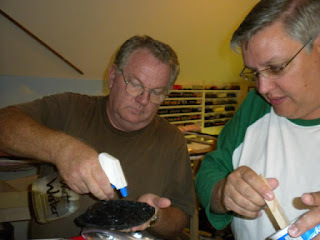 Most of us had a few molds and since we seldom use them, were glad to loan them out. Bob cast every single one of them so that we could see how they turned out. 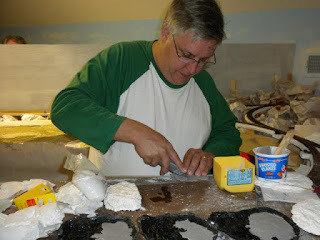 One thing I would do over if we do this again is to put each mold and rock set in a Glad zipper bag with the owner's name and a rough description of the rock. Also, we need to indicate which way is up on the back of the demonstration casting. 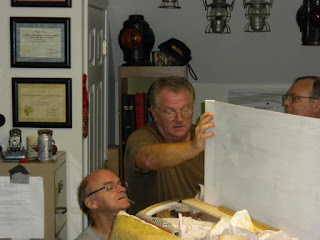 Scott test fits a mold prior to filling with plaster, just to make sure it will fit. Coalfinger Ken is allergic to plaster and kept his fingers dry all night. We kept the Rit dye away from him, too. 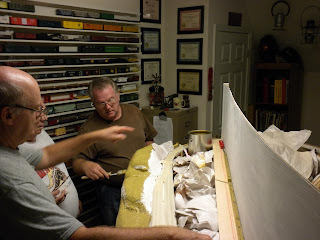 The guys are discussing the scenic divider and putting a coat of paint on the scenery section. Ken is using a long passenger car to see if we have enough clearance. Looks like we do! 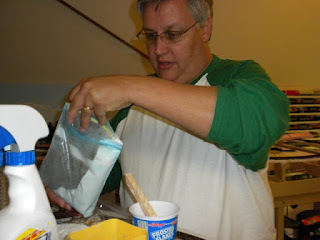 Stiring up the plaster mix to get just the right texture! 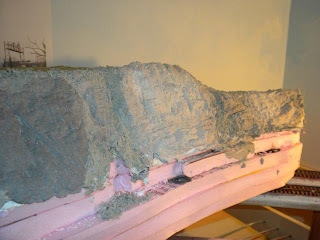 The mold has been cleaned and sprayed with a soap and water mixture to work as a release agent and a wetting agent to help the plaster slip into the cracks and crevices. The plaster, which is a little more soupy directions would tell you to make, will creep in to each and every cranny. 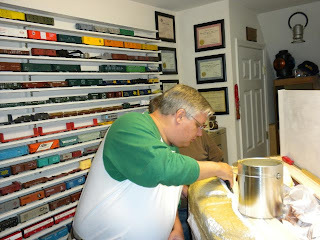 Here, Paul is treating the molds. We were glad to see him out of the foot brace and walking on his own. Its a hard climb to the top floor, but Paul's a trooper. 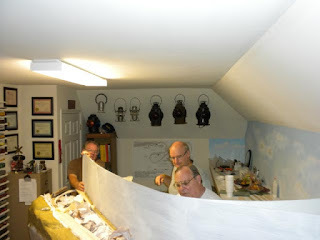 While Scott and Rick worked on the rocks, Paul, Bob and Ken worked on the backdrop. It seems that when we put it in last time we made it too close to one side making scenery installation difficult. As he should, Bob insisted we move it. 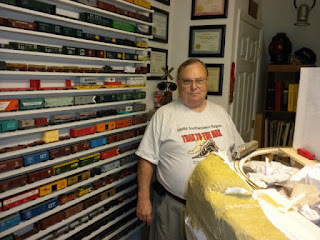 Many modelers are very tight about not moving something that is already installed and hoping to work around the issue. DON'T DO THAT! Tear it out NOW and fix it! You'll be glad you did! 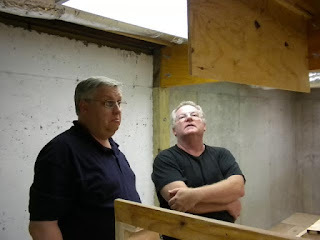 Scott is waiting on the rock mold to get to the not quite dry and not quite wet stage. The Rit dye is acidic and slows down the drying/curing process. 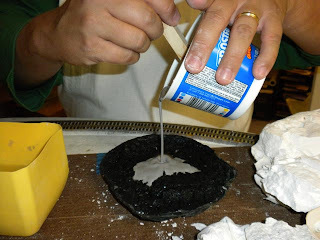 This is good for rock molds because the slower it dries, the better the detail. Scott also had a hard week and takes naps between steps. Bob made several modifications to the back drop. Rick, just how did you get this picture, anyway? You can see from here that Bob doesn't have enough light in the room. Its been a struggle, but the scenery steps we need to take will not work without proper lighting. I think we'll have to encourage him to add two more light fixtures before we go further. 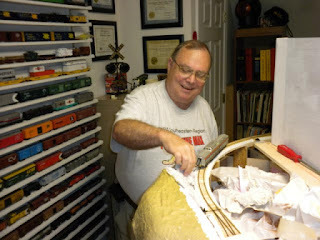 With the scenic divider/back drop in the right place, Bob drills and screws the base to make it stable. Scott has several "thin" castings in the works. 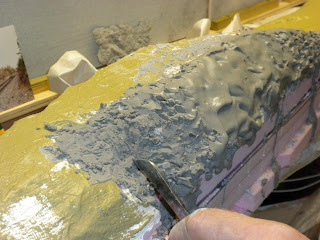 One area that we are working in has very little clearance so we are just pouring a little plaster in the molds to get a wafer thin rock face. These we let dry completely and glue them on with hot melt glue. 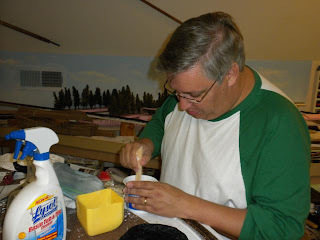 Scott was a bit too excited to be working on the rocks because he shook up the bottle of water and soap, causing some bubbles on the mold. Hydrocal plaster is very good about producing every detail...including bubbles which are seen here. Some of the wafer rocks didn't quite fit, so Scott scores them with a razor knife on the back and gently breaks them to fit. 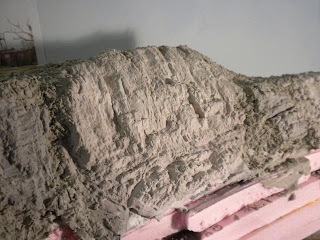 Here you can see the castings lining up on the rock cut. 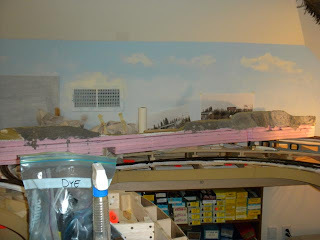 The rest of the scenery was painted by Bob and Rick with a water based house paint that was picked up at Home Depot on the rejects shelf. It appears a little gold here in the photo, but really looks good as a base coat. This scenery section is removable for now and instead of trying to figure out how to get Rick to carve rock facings while standing on his head, we removed the section and let him work face to face. 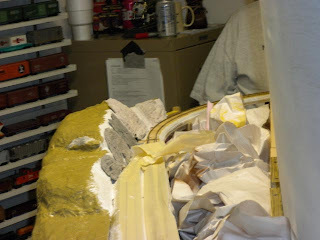 His job now is to carve the rock areas where castings don't really fit, and to fill in the gaps between the castings. 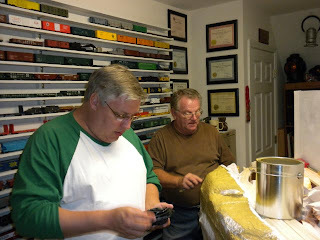 Rick has a ton of experience carving rocks on his own layout, so we all stood around and watched. The plaster was allowed to get not-quite-dry and a bit like putty. 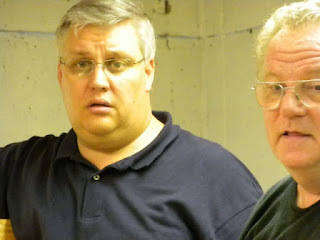 He then took and old knife and a putty knife and gouged out chunks of plaster. He carefully worked it in the look like rocks. The now gray rocks are a result of the black Rit dye. 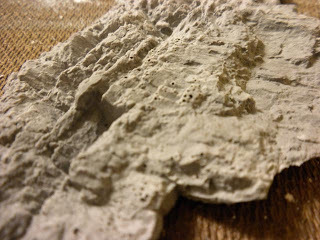 The dye makes the plaster gray throughout so that if it chips you don't see a bright white spot! Rick takes his time, and frequently wets the surface again with a spray bottle containing pure water. This slows down the drying time and gives him time to work. We tried a casting in this spot but the roundness of the outcropping didn't work well with the casting. When we put it on Rick was brave enough to tell me that it looked really bad, so we chieseled it of. I appreciate the honestly because in some groups people will just let you make a mistake and keep going. My philosphy is that I want it to look as real as possible and don't mind a do-over. When someone is straight up with you it is not nice to kill them. Rick will be missed. The odd looking area that Rick is working on is an access area to a ground throw. We'll come back in here and add rubble. We moved the scenic section over to the far wall to let it dry. Bob will come back later and rake over the castings with a wire brush to remove carving pieces and to help make the castings look as one. While the different colors of gray look funny, once we color these rocks with stains, they will all mesh into one. The rock in the area modeled has a lot of iron ore in it, so they are very rusty red. 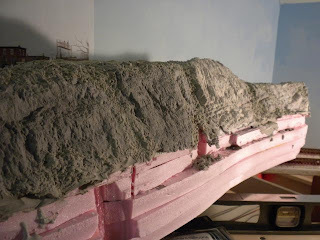 All in all about nine molds were used and a bout two feet of hand carved plaster is on this seven foot long section. I like having the foam scenery section removable for a time while we are working on it! All of these rocks are backwards to the viewing audience and will be in photographs, so they had to be done right even though we might have cheated a bit. This section in the photo is about 2-3 feet long. For the Canadians watching the blog, it is about 2-3 feet long. LOL. This particular section will be in a much photographed place along the right of way. Photo opportunities are built in to this layout during the designe process! This is critical for magazine photos. All of this rock is hand carved. 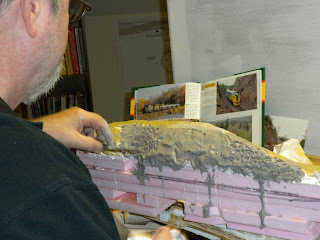 We'll probably glue a few flat pieces to it to make it mimic the Ontario Northland rock. Nice! 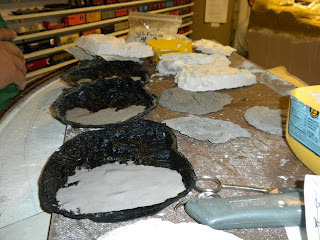 The rocks will dry and will be ready for our next scenery session. See you then! 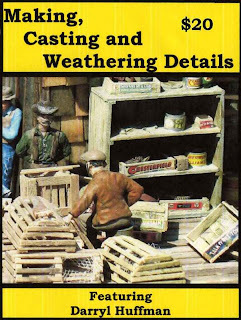 I like this clinic for painting and weathering. 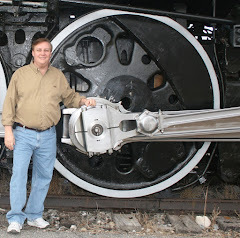 I'm getting ready to build my Gator's Bait Shack for the Okefenokee Railroad, so I'm looking for new ideas. When I get rich I'm buying one of everything from Sierra West! 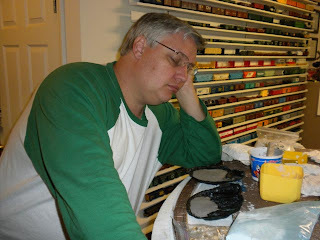 Join me as I start on another layout design extravaganza! The White Pass & Yukon in On30! 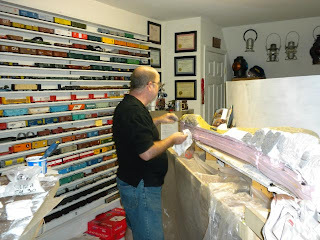 The new Trainmaster Models store is open! I went by and had a hot dog and enjoyed 10% off. Marie liked it so much she stayed! The new store is awesome and only 4 miles from my house! Best of luck to the Devaney's on their new store! It is almost not fair for the guys for me to show up on Friday nights. I'd been up since 4:00 am and have traveled half way across the country to get there and could hardly keep my eyes open. The guys must think I'm not much help. My family asked me to stay home, but hey, its my birthday and I want to play with trains. 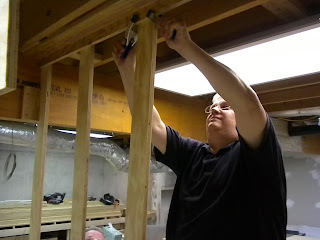 Tonight: Packrat Paul's house - building mushroom benchwork. Steve-bay got a pass since he was marrying his daughter off. All photos courtesy of Popsicle Rick and his handy dandy new pocket camera which I will steal from him as soon as he's not looking. I want one! Paul knew how he wanted to build the upper deck of the mushroom as he'd been designing it for a few weeks. 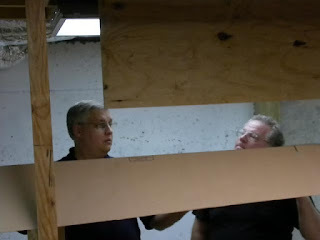 We did have a discussion about eye level and the height of the openings, but all decided it was "go". 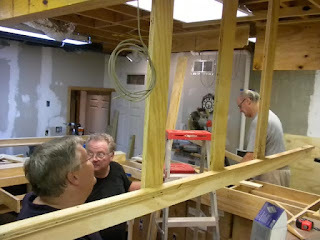 Using 1x4's mounted to an L-girder screwed to the ceiling, we hung the lower L-girder which will be the top of the mushroom deck. 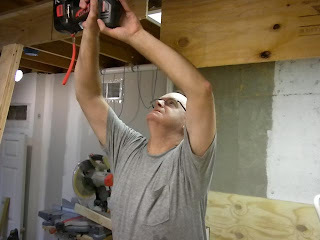 We turned the L-girders sideways and Bob screwed them in. 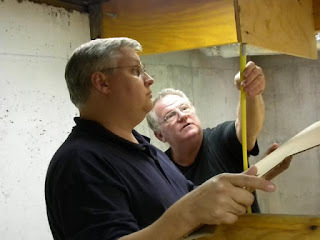 Bob's is the tallest of the team, so he gets a lot of the high altitude work. 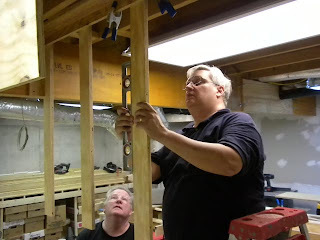 Using a ladder, Scott puts in more supports and Paul (who still has a brace on one leg) hands up tools and screws. 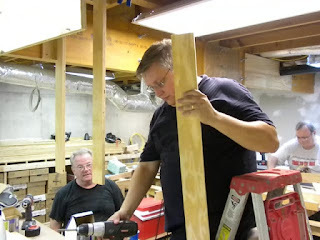 Since this was the first of a lot of tricky benchwork, we often sat back and made sure that things were going the right way. So far...looks good! We carefully checked the boards to make sure they were straight. Perfect! 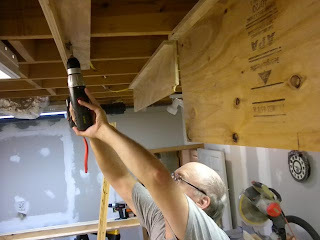 Then each was fastened on to the L-girder with three 1 5/8" screws. Yes, Scott was tired. He banned himself from even using the saws that night. Paul was rarin' to go! 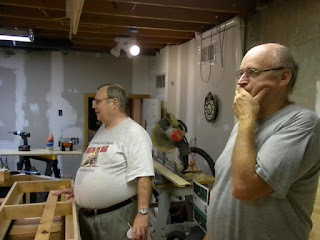 The place where Scott, Ken and Paul is standing is the upper deck of the mushroom, and Bob is standing in the lower deck. We took our time building the decks, but we wanted to make sure they were strong and straight. 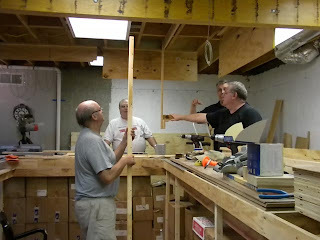 Measure twice, cut once, throw in the scrap wood bin, get another piece, measure again, then cut. Yes, that was my thumb that the screw just went into! I don't even remember what we were doing here. Just to check to see how the scenery might look, Scott and Paul mocked up a mountain with cardboard. It looked great! 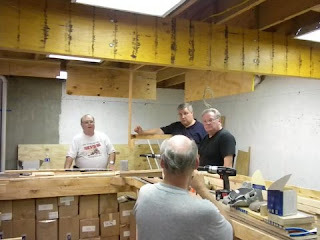 Ken worked the lower deck where most of the tools were. Since it requires people on both sides, mushroom construction really does take a team effort. Thanks guys for a great evening! It cheered me up after a really long and terrible day. Thanks Popsicle Rick for the great birthday present! The clamps and weights will really come in handy! 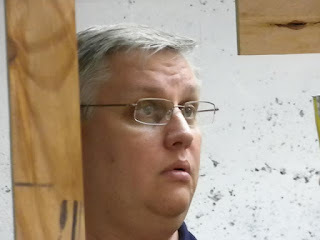 Also, thanks Rick for the pictures. I'll see if I can get Paul to send me a picture of the finished benchwork.